2 True is a cheaper brand stocked in most Superdrug stores. I have never brought anything from the brand before but after seeing a few reviews on these polishes I thought it was about time. The polishes are marked at £1.99 each, or buy any three for £5, which is what I did. At this price, I wasn't expecting anything amazing, but their not bad. Shade 17 is a pastel coral, but with a slightly more orange tone. Shade 15 is a pale blue and shade 16 is 'barbie pink' colour. 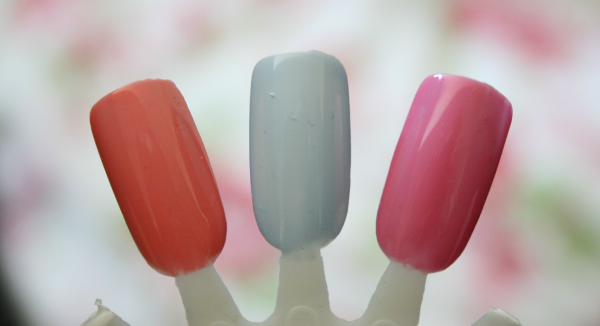 All the colours are very wearable for spring/summer, and only two coats needed to be opaque. The brush is flat which makes the application process extremely quick and easy. The polish also dries very quickly. Overall, these polishes aren't bad! The application process is very quick, as only two coats are needed and it dries fast. The colours are quite generic and nothing extremely special, but I do really like shade 15, which I'm going to wear today. If you are on a budget these are perfect basic colours for a great price. #16 is such a lovely colour, I've never heard of 2True before now, might have to check them out! Cheap and cheerful ey! I love the blue. haven't tried the nailpolishes because i can't pick them up where i live but i love the pale blue. and the price fot them is so good. such a bargain. I think these sound I am always looking for cheap nail polishes which last.